An unlimited range of Art works stretcher We work from templates provided by our customers (portraits, paintings, photos etc.) and/or suggested by our team of Art experts, all in accordance with the project aims. 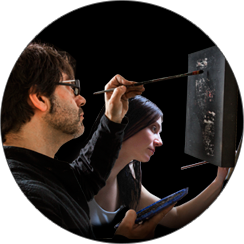 An artistic team that focuses on personalization Our Painters and Designers combine their skills to subtly alter the artisitic details of a painting and make it one-of-a-kind, tailored to the value of its owner. Proven, experienced, service quality Production is monitored and checked throughout the work. Samples of the remastered works are submitted to customers for approval. The best quality for price in the market By using our own workshops for production, we can control costs, making our service one of the most competitive around. 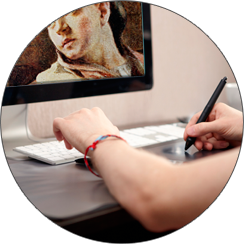 Our graphic designers customise or recreate your painting with the precision of the latest digital technologies (image retouching, colourimetry, adding details etc. ), for a unique artwork that is adapted to the tastes of its owner and/or their surroundings. 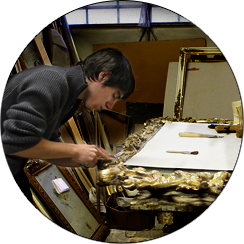 Our painters then reproduce the customer’s approved image by hand, using the traditional technique of oil painting on canvas. We are able to produce paintings in very large formats. The canvases are then mounted within a bevelled wooden frame – we offer a framing service that is tailored to your needs and desires to add the finishing touch to your painting. 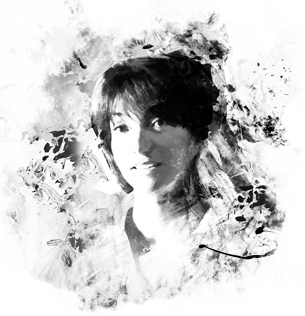 Meet the multi-talented team that will bring your projects to life.